The Books of the Infinite series is excellently written Christian fantasy. Larson has created a world that is reminiscent of the Old Testament, complete with fantastic creatures (like the dreaded scaln and the dinosaur-like destroyers), that is also realistic and enthralling to the contemporary reader. I have been anticipating the release of King since finishing the second book, Judge, and it did not disappoint. 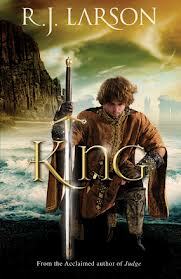 This third book, King, wraps up some of the themes from the first two narratives, while also being a complete story. I do, however, recommend reading each book in order as there is so much character development in the first two stories, as well as subtle moments of reflection upon past events that would otherwise be missed. The central character in King is Akabe Garric, who is chosen to be King of Siphra despite his wishes. Akabe makes some hasty decisions, putting his kingdom in grave physical danger. As he struggles to wait for the Infinite’s direction there are battles, miracles, and both physical and emotional challenges. Beloved characters Ela and Kien also play large roles within the story, and struggle with some obstacles of their own. The story is packed with action, strongly reflects the themes and events of several Old Testament Bible stories, and even has a bit of romance. I know R.J. Larson has mentioned she prefers writing historical fiction, but her ability to write such brilliant biblical fantasy is truly a gift. I hope she delves deeper into this genre!